I would like to share with you an original experimental metal song by CorvidCanine called “Crow’s Commentary” written and performed by Matthew Borders a.k.a. CorvidCanine. Matthew warns us to listen to it at a low level at first… you can download Crow’s Commentary here. You can learn more about the special project here. Or you can hear all of his music here. Thank you for sharing Matthew! Crow, originally uploaded by russthedutch. There were three crows sat on a tree, Oh Billy Ma-gee Ma-gar! There were three crows sat on a tree, Oh Billy Ma-gee Maggar! Caw, Caw, Caw, Billy Ma-gee Ma-gar! Said one old crow unto his mate, Oh Billy Ma-gee Ma-gar! What shall we do for grub to ate? Caw, Caw, Caw, Billy Ma-gee Ma-gar. And pick his eyes out one by one. no-one to be found, an empty window. making a living grooving to their rhythm. but I must just try to bust a move but who can I trust? a ripple on this frozen lake. I know you want to cry but I’m earning my guitar. I’m burning my fire, my funeral pyre, the harder I try. 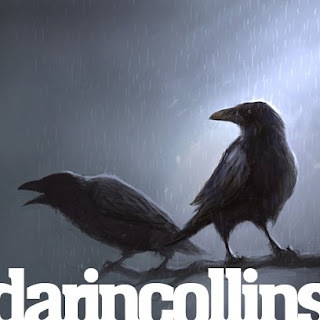 You can read more about Darin Collins and this song here.